Changing market dynamics and consumer trends are aligning to create a risky claims environment for pet food manufacturers. Companies that want to grow the category or take share from competitors may need to be more aggressive in the types of claims they make. At the same time, consumers and regulatory bodies are asking more questions and demanding that companies are transparent and truthful in their marketing. We’ll see more frequent claims challenges in the future, whether from competitors, consumer groups, or regulatory bodies. Given the damage that a protracted claims challenge can do to a brand and reputation, pet food manufacturers will need to be prepared to respond quickly. Traditional channels are shifting and competition is getting fierce. Pet Specialty stores have historically controlled the premium and super premium segments, however as grocery and mass retailers are forced to look for opportunities to preserve margin in the face of pricing pressure from the likes of Amazon and Walmart, they too are aggressively pursuing the premium segment. At the same time, online brands from Amazon (Wag) and Chewy are making inroads as legitimate players. What are the implications? Claims will be even more important as a way to differentiate, and companies will be more likely to challenge a competitor’s claims to defend share. It seems cliche at this point, but most pet owners really do treat their pets like family. As they do for their children, consumers care deeply about what they feed their pets. Trends driving change in food consumption among pet owners, such as natural/organic, local sourcing, hormone free, “superfoods”, and functional benefits (probiotic and other), are also drivers of consumer choice for their pets. According to a study by Perkins Coie, the number of filings for “natural” pet food claims in 2018 through September equalled the number of similar claims filed during the five preceding years combined. What are the implications? 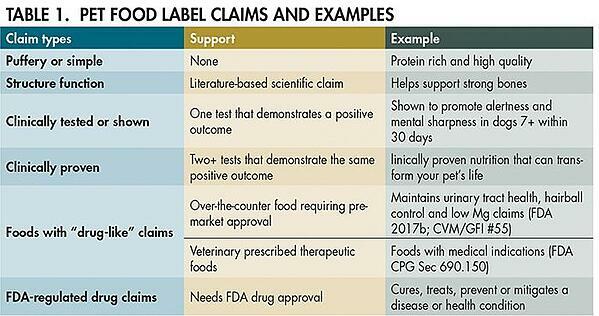 Companies will seek on-trend food ingredients and claims around the health benefits related to them - many of these claims may come close to implying treatment of the product as a new animal drug under the FFDCA, which would require a review by FDA-CVM, and will invite FDA attention in the form of a warning letter. Consumers no longer implicitly trust companies that manufacture the products they purchase. Headlines today are full of examples of companies in hot water for false advertising or misleading claims, whether due to willful intent or factors less under company control. Consumers are skeptical, they want proof, and even given proof they may require approval or a recommendation from social networks or trusted advisors. Need some proof? I thought you might; here are some interesting data points. According to PetfoodIndustry.com and a survey by Packaged Facts National Pet Owner Surveys 2018, while 62% of consumers (top two box) agree that scientific research provides valuable information on pet food and nutrition, only 29% (top two box) agreed that scientific research sponsored by pet food companies is unbiased. What are the implications? The net effect is that consumers and consumer watchdog groups will be quick to challenge claims made by companies for which evidence is at all suspect. This final factor simply refers to the momentum that challenges within a category can gather over time. I do believe there’s something to be said for a few challenges within a specific category spawning additional challenges until the category is deemed “cleansed”. What are the implications? Pet food is in the crosshairs of consumers and regulators. The focus will likely remain on the category until such time as consumer trust is restored. Veeva Claims helps companies manage their marketing claims from inception to eventual use in marketing content, packaging, and assets. Reduce regulatory, legal, and brand risk by having all the necessary elements to respond to a challenge at your fingertips - review and approval workstreams with referenceable audit trails and e-signatures, substantiation documentation linked to the claim, and downstream traceability to all instances of use in market.